Ramblings of a creative mind! Have you heard of Fancy Nancy? A friend of mine has a granddaughter ~ Fancy Claire! Actually just Claire but when she is sporting piggy tales, stripes, polka dots, Batman leggings and a sassy attitude - She IS Fancy Claire! Claire's grandmother is a dear friend and she asked me to paint a vanity set to go in Claire's new "big girl" room. She mentioned that she really liked McKenzie Childs' pieces and thought that something along that line with a little Fancy Nancy infused would be perfect. So whatdaya think?? 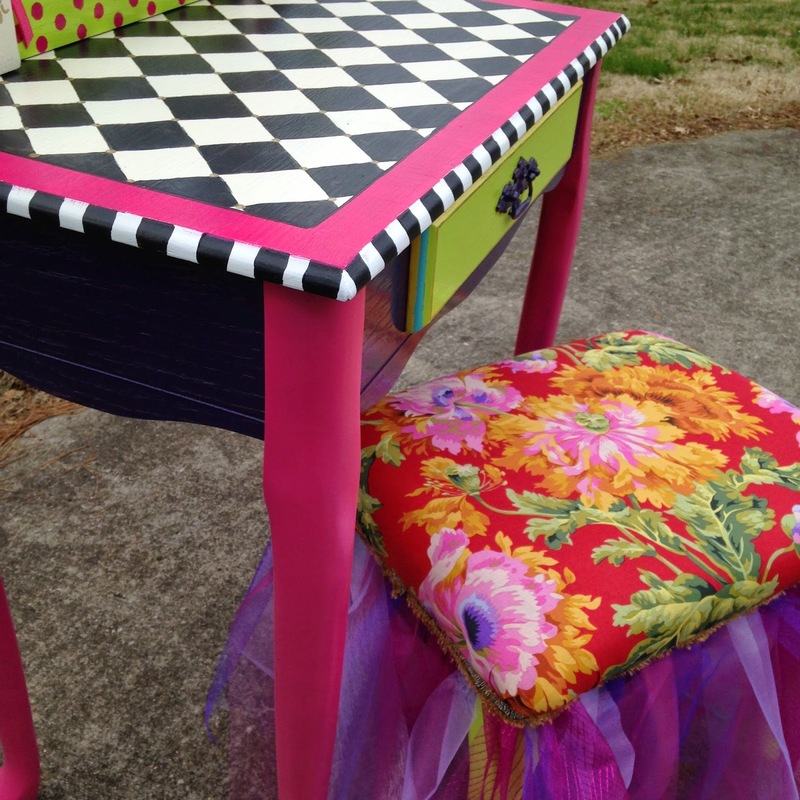 I have always wanted to paint a piece like this - full of color and pattern and lots of whimsy. Here are some other shots... starting with the "before" pics! I almost picked another fabric for the seat. My friend, Maria, picked this and insisted that I use it. She was right. It is perfectly unexpected and with the tutu .... ooo la la! It's Fancy Nancy! So there you have it! 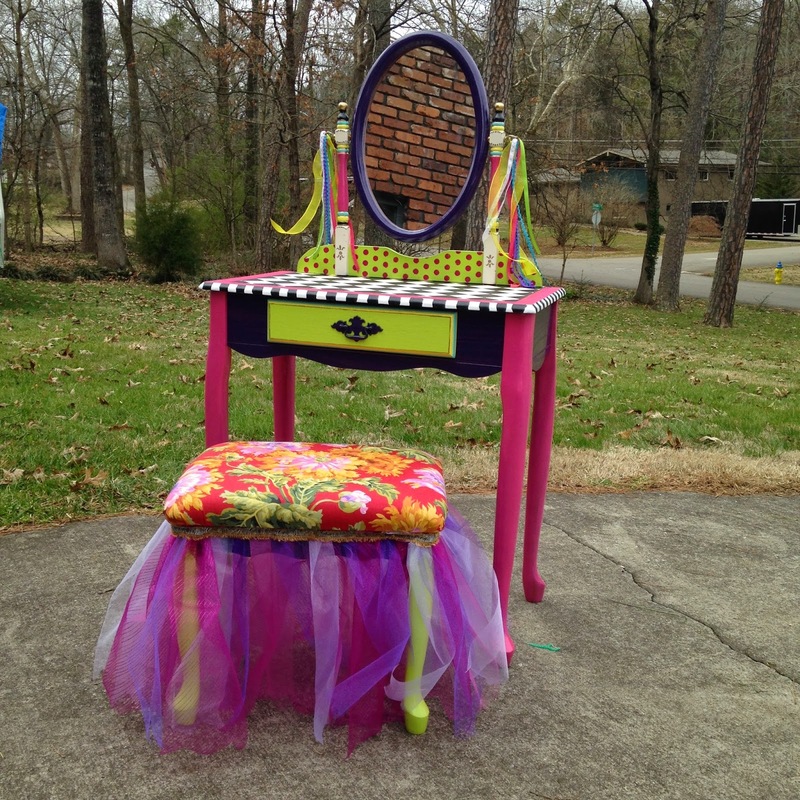 The Fancy Nancy, McKenzie Childs inspired vanity for Fancy Claire! I can't wait to hear how she likes it. Dang! I need a granddaughter! Well... not yet boys! Let's graduate from college and get married first???! Thanks for stopping by my blog friends! Let me know where you are visiting from and "follow" me as I pick up the pace and use all this creative energy on something. Give thanks in all things. And pass along a smile to someone who needs one today! Follow me as I fill life with treasure hunting, painting, staging homes, redesigning others, and anything else that allows me to expend a little creative energy! Be sure to leave a comment and introduce yourself! Home Decorating Made Easy BLOG! Lori Bishop Designs. Simple theme. Powered by Blogger.